This “Carriage” weldment is one of several assemblies we make for the MK93 mod-2 machine gun mount used by U.S. Armed Forces and NATO Countries. It’s the pivoting joint that allows a .50 Caliber Machine Gun or MK19 40mm Grenade Launcher to be rotated when mounted on HMMWV’s, Helicopters, and Naval vessels. Made to strict military standards, parts are laser-cut, formed, and pre-machined prior to robotic welding. The weldment is stress-relieved before final machining in order to meet tight GD&T requirements. After dimensionally validating 62 locations, the weldment is finally sent out for magnetic particle inspection, then Phosphate and CARC coating. 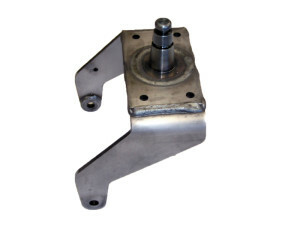 Product Description – Carriage Assembly, MK93 Mod 2 Machine Gun Mount. Processes – Single Arm Robotic MIG Welding, using Farris wheel positioner. Quantities – Production lot sizes of 800 pc to 1,000 pcs.